Are you sick and tired of having to launder stains on your shirt, blouse, or other clothing, due to mealtime spills? The trouble is, we ample-sized people present a bigger target for such spills—they can't help landing on us! The traditional napkin on your lap may work for average-size people, but for us, it offers little protection. 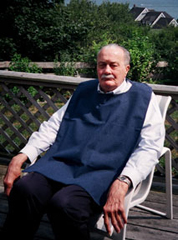 Finally, a large-sized bib that will cover everything, and with larger neck sizes as well! These cotton-poly terry bibs have a waterproof backing and are perfect for car, home, sickroom, and restaurant use. 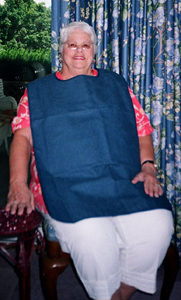 With a length of 36", the bib even covers your lap. The neck closure is adjustable with a hook-and-loop fastener. Made in USA.